"A treasured photo secured between two pieces of glass presents a new twist to traditional stained glass window art. The artwork gives the glass a frosted look, yet still allows light to shine through. The photo is enhanced with a translucent quality, and an applicable scripture is typed below it. Hang this special piece in your kitchen window for maximum exposure." 2. Add a verse and decorative symbols to your image. Print onto clear adhesive label paper, or make a mock-up of your picture and a verse and color copy it onto the label paper. 3. Peel and stick the artwork between the two squares of glass. 4. Tape around the edges of the glass with the copper, in order to bind the two pieces together. 5. Bend and adhere two wire loops to the top edge for hanging. 6. Bead, bend and glue a decorative wire design on the bottom edge. 7. String and tie a ribbon for hanging. 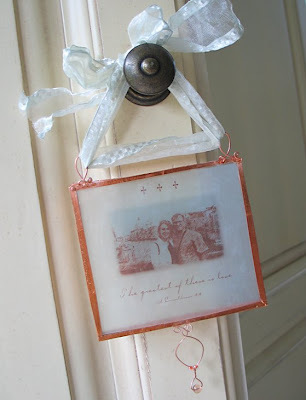 Give cream ribbon a bath in watered-down aqua paint overnight to create more depth and a worn look. I hope you have fun with this! I'd love for you to email me your photos when you're done! what a beautiful project! thanks for sharing! Very professional and beautiful! I need to remember this one for a gift! Jeanne, I absolutely love your blog. It's so everything. I love its style, the color choice, fonts, layout. Congratulations on your business. Much success.